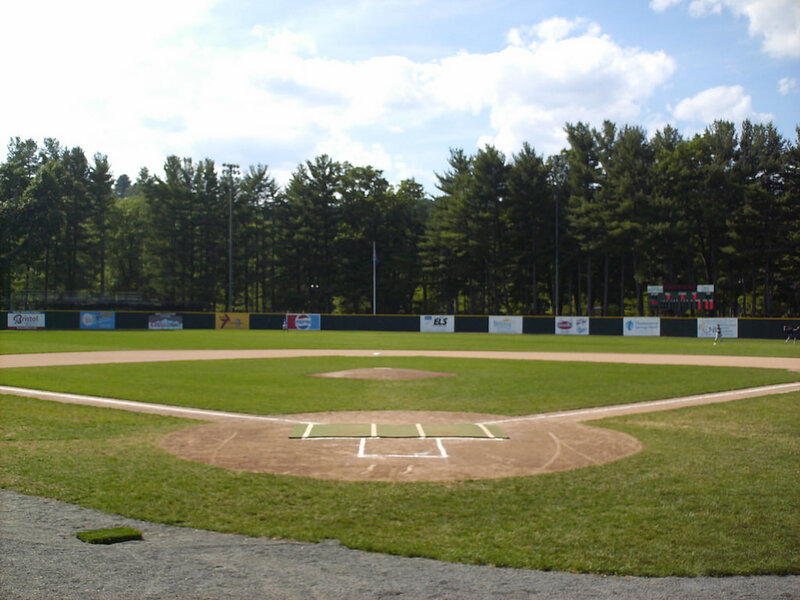 Muzzy Field is a stadium in Bristol, CT adjacent to Rockwell Park. It has been in use since 1912 for both baseball and football. The brick-faced grandstand, with a capacity of 4,900 people, was built in 1939. It features a ring of tall pine trees that line the outside of the outfield wall and the grandstand. Muzzy Field was the home of the Double-A Bristol Red Sox of the Eastern League from 1972 to 1982. Former Boston Red Sox stars Jim Rice, Fred Lynn, and Butch Hobson honed their skills with the "BriSox." The ballpark also housed the old Bristol Owls of the Class-B Colonial League in 1949 and 1950, as well as various amateur baseball teams, notably the Bristol En-Dees and the local American Legion team. The University of Hartford baseball Program used the venue for some home games prior to opening Fiondella Field in 2006. Muzzy Field was the site of the Big East Conference baseball Championship Tournament from 1985–1995. In 1991, Joe Archambeault put together a barnstorming exhibition New England Grey Sox team, including former Boston Red Sox players and other major-leaguers including Bill "Spaceman" Lee and Ozzie Virgil. They played against a team of local men, the Undefeated Bristol Fradette Agency, on June 1, 1991, in front of 5,000 fans. n 2012 and 2013, the City of Bristol approved a renovation of the ballpark to include a new front entrance and public concourse, new lighting, seating, ADA improvements and a new grandstand enclosure along the Muzzy Street side of the stadium connecting to the existing grandstand.